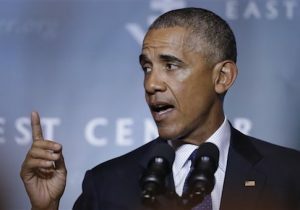 Obama sent a letter to Congress on Thursday reacting to the commission’s final report of recommendations, which the Washington Free Beacon first reported in July. While he agreed with the majority of the commission’s 18 recommendations, Obama expressed "concerns" about establishing a board of directors responsible for the overall governance of the VA health care system. "I have concerns with the Commission’s proposed governance structure for the VA health care system," Obama wrote. "The proposal would undermine the authority of the Secretary and the Under Secretary for Health, weaken the integration of the VA health care system with the other services and programs provided by the VA, and make it harder—not easier—for VA to implement transformative change." Obama also said that he was told by the Justice Department that the recommendation "would violate the Appointments Clause of the Constitution," though he didn’t expand on the reason for this concern. In its final report, which outlined a plan for "far-reaching organizational transformation" at the VA, the commission cited "weak governance" as one of the root causes of the Phoenix VA wait list scandal uncovered more than two years ago. As a solution, the panel recommended that Congress provide for the formation of an 11-member board of directors, accountable to the president, that would be "responsible for overall VHA Care System governance" and would have "decision-making authority to direct the transformation process and set long-term strategy." The board would also not be subject to the Federal Advisory Committee Act, under the commission’s recommendations. "The governance limitations made evident in the Phoenix scandal have profound implications for the long term," the commission’s report stated. "The Commission believes [the Veterans Health Administration] must institute a far-reaching transformation of both its care delivery system and the management processes supporting it." "I am disappointed the President refuses to acknowledge the fundamental changes that need to be made to the VA’s governance structure to ensure that our nation’s veterans get the care they need in a timely manner," McMorris Rodgers, who has introduced draft legislation that would overhaul VA health care management and delivery, told the Washington Free Beacon. "While I am pleased the President agrees with the majority of the Commission on Care’s recommendations, more needs to be done to transform the VA into a veteran-centric system that puts veterans in charge of their health care and ensures that those charged with caring for our heroes are accountable for their performance." The 15-member commission spent months receiving testimony, visiting VA facilities, and reviewing an agency-commissioned independent assessment released a year ago that found the VA’s network of hospitals facing crises in leadership and culture that warrant "system-wide reworking." Reaction to the commission’s nearly 300-page final report has been mixed, with some describing its contents as encouraging and others saying the recommendations do not go far enough. Two members of the commission declined to sign the final report and wrote a letter of dissent that said the proposals fell "far short of what is needed" to transform veterans’ health care. The dissenting commissioners did, however, credit the proposed establishment of a board of directors to oversee the transformation process at the VA.
"The central problem is that these recommendations focus primarily on fixing the existing VHA provider operations, rather than boldly transforming the overall veterans’ health care system," wrote Stewart Hickey, former national executive director for AMVETS, and Darin Selnick, senior veterans affairs adviser for Concerned Veterans for America, a veterans group that has been critical of the recommendations. "President Obama’s letter doubles down on the Commission on Care’s recommendations, which would keep access to health care in the clenches of the VA bureaucracy and out of the hands of the veterans who need it," Dan Caldwell, the vice president of policy and communications at Concerned Veterans for America, told the Free Beacon. "I’m pleased the president has reviewed and responded to the commission’s report, which our committee looks forward to examining in detail during our upcoming Sept. 7 hearing," Rep. Jeff Miller (R., Fla.), who chairs the House committee, told the Free Beacon. "But VA will never be fixed until President Obama and his administration get serious about holding VA employees who can’t or won’t do their jobs accountable and stop undermining laws that were designed to reform the department." "I am committed to ensuring veterans have timely access to quality health care, and I look forward to our Senate committee’s hearing on the Commission's recommendations later this month," said Sen. Johnny Isakson (R., Ga.), who chairs the committee in the Senate.